Maruti Suzuki, one of the leading car manufacturers in India, which is known for reliability and fuel efficiency is bringing a new flavor of its very popular Maruti Alto K10. The Alto K10 is doing well in the domestic market currently which may soon feel the heat from its competitor – Renault Kwid which has crossed 25000 bookings just in weeks after its launch. The car slightly lags in getting the modern day features which every customer desires and therefore Maruti Suzuki has launched a new variant of the Alto K10 calling it as “Urbano”. 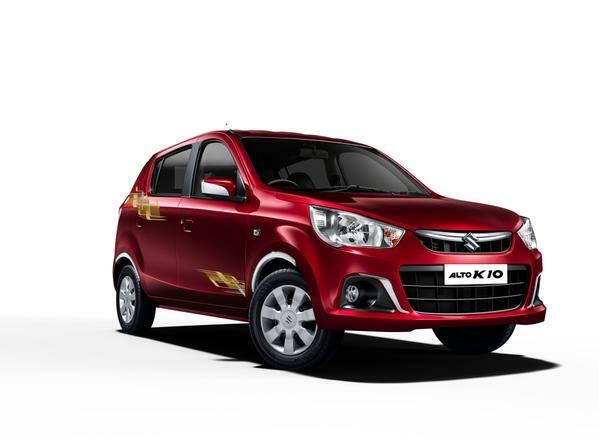 New Maruti Alto K10 Urbano is well set to delight its customers with its new looks and features by this Diwali. Maruti Suzuki has included 18 new features in order to sell to its customers. The new Alto K10 Urbano is equipped with premium art leather seat covers that comes with special bucket design as well as matching steering wheel cover, designer mats and pedals. When it comes to design and styling, the car gets an interior styling kit with an ambient light and an LED door sill guard in order to boost the cool quotient of Maruti Urbano. Speaking at the launch Mr. R S Kalsi who is the Executive Director of Marketing & Sales at Maruti Suzuki India said that the Alto K10 Urbano comes with characteristic black and silver theme with complementary body graphics and garnish. Several other features like reverse parking sensor, hands-free Bluetooth kit, fast USB car charger etc., bring delight and convenience to the customer. These features make Alto K10 Urbano more stylish and trendy. They are confident that customers will appreciate this limited edition. The exteriors of the Alto K10 Urbano are brilliant and is designed with chrome garnish on outside rear view mirrors, back door wheel arches, tail lamps plus fog lamps. This gives the exterior styling of Alto K10 Urbano a fresh look. Other features of the new Alto K10 Urbano include a hands free Bluetooth kit, reverse parking sensor, fast USB charger with voltage and temperature display and long range vision bulbs. Maruti Suzuki has launched the Alto K10 Urbano before Dasara and Diwali. This would surely boost the sales up. The new Alto K10 will take the legacy of the Alto Brand forward. The Alto K10 Urbano is costlier than that of Maruti Alto K10. An extra INR 16,990/- has to be spent for these 18 additional features. The Alto K10 Urbano shall be made available in LX, LXi, VXi and VXi (o) trims, along with CNG.